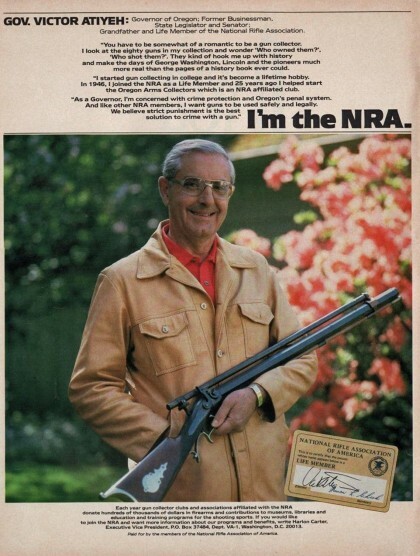 Surfing Etsy for some any interesting antique NRA memorabilia, I came across someone selling old magazine advertisements, including one of an old “I’m the NRA” ad that featured a sitting (at the time) Governor of what is now a deep blue state. Clippings, correspondence (including copies of outgoing letters from Atiyeh), and a preliminary drawing of a gun case Atiyeh commissioned for one of his guns. Case of medals Atiyeh won during shooting competitions, as well as one Dolores Atiyeh won. The Dolores mentioned is his wife. That indicates that they both enjoyed competitions. Based on the years mentioned in that index, some may even be from after the years he was first elected to the Oregon legislature. Just the same, I do wish we had more of his ilk in power today. That any pol was an NRA member and appeared in a pro-NRA add tells me nothing useful. I remember when PA AG Mike Fisher was the NRA’s poster-boy (though not in an “I’m” ad) as candidate for governor, after he had fought us tooth and nail to defend even the worst provisions of Tom Ridge’s pet anti-gun legislation. He even fought curative amendments that did nothing more than fix contradictory provisions in the legislation. However, I was there for a quasi-secret meeting sponsored by the NRA in Harrisburg, at which they awarded him their CrimeStrike “Defender of Justice” award for stumping for a number of anti-civil-liberty bills in the name of “Getting Tough of Crime.” Even those, most RKBA activists in the state had opposed, but advocating for Hang’em High laid the foundation for his NRA recovery. Most activists, including myself, who attended the meeting (with Tanya Metaksa chairing) boycotted the portion in which Fisher was there and received his award. So, being a governor and holding a lovely gun (if it’s really his, I like his taste in shooting sports) in an NRA ad tells me nothing. Vincent Fumo, the state senator who sponsored one version of what became the comprehensive gun control bill mentioned above, I’m told had a lovely collection of Class 3 firearms. The last time I checked, he was still in federal prison on charges of corruption. Oregon is a blue state (Wolfman is correct, but the Blue Enclaves have the votes to run the show, so it makes no difference that they’re only Enclaves). But it’s not one that’s very hostile to gun rights. It’s not that the “Blue Enclaves” aren’t hostile to gun rights – they are – so much as the red- and purple-district Democrats aren’t willing to throw themselves under the bus to support restrictions. Despite Democratic control of the House, Senate, and Governor’s office, gun bills almost always fail by a very (uncomfortably) close margin. The real problem with the people in power in Oregon is that the Senate President and the Senate Judiciary Committee chair are both committed anti-gunners, and they have the power to “gut-and-stuff” any bill, as long as the summary clause remains the same (i.e. the generic, over-broad, and over-used “Relating to firearms”), which means a lot of pro-gun bills get transformed into anti-gun Frankenstein bills. (Seriously.) I often wonder if they can use something a bit more specific than “Relating to firearms” to make the “gut-and-stuff” practice more difficult, because as it is, two people essentially have total control over what can and cannot pass the legislature in Oregon.